LONDON, England (CNN) -- British Prime Minister Gordon Brown said Thursday he was "disappointed" over the resignation of his work and pensions secretary, the third Cabinet minister to step down in as many days. 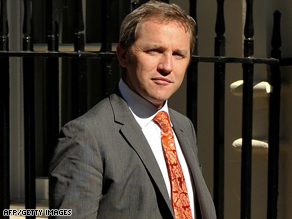 James Purnell arrives for a Cabinet meeting at Downing Street on Tuesday. In a scathing letter sent to members of the British news media, James Purnell called on Brown himself to resign or face certain election defeat at the hands of the opposition Conservative Party led by David Cameron. "I now believe your continued leadership makes a Conservative victory more, not less likely," Purnell wrote. "That would be disastrous for our country. This moment calls for stronger regulation, an active state, better public services, an open democracy. "It calls for a government that measures itself by how it treats the poorest in society. Those are our values, not David Cameron's." "We therefore owe it to our country to give it a real choice," Purnell said. "We need to show that we are prepared to fight to be a credible government and have the courage to offer an alternative future. Purnell allowed, though, that "if the consensus is that you should continue, then I will support the government loyally from the backbenches." In a written statement, the prime minister's office said Brown learned the news just before 10 p.m. (2100 GMT), and would focus in coming days "on the big challenges facing the country for the future: how we guide the economy through the downturn and strengthen it for the future; how we push ahead with reform of and investment in our public services; and how we renew trust in our democracy and Parliament." Purnell resigned as polls closed Thursday for local elections. On Tuesday Home Secretary Jacqui Smith announced she would be standing down. She was replaced by Health Secretary Alan Johnson in a Cabinet reshuffle Friday. The reshuffle saw under-pressure Chancellor, Alistair Darling, retain his post, while John Hutton stepped down as Defense secretary. Smith had become embroiled in the expenses row after listing her sister's London home as her main residence. In March her husband, who also works as her aide, was forced to issue a public apology after he admitted paying for adult movies with taxpayers' money. The following day Communities Secretary Hazel Blears announced her resignation in a statement just two hours ahead of the weekly Prime Minister's Questions session in the House of Commons, saying she wanted to "return to the grassroots (where I began), to help the Labour Party to reconnect with the British people." Purnell's direct challenge to Brown raises the question of how long the political career of the Labour Party prime minister will continue. Brown has vowed to fight on. Key to his political survival will be how his party fares not only in local elections, but also in elections for members of the European Parliament, which are taking place through Sunday. All 27 EU member states are voting with 736 seats up for grabs. In Britain, polls show popular support for the Labour Party at historic lows. CNN's Robin Oakley contributed to this story from London.